Wild Oak Barn in Ottery St Mary, Devon sleeps 8 people. Wild Oak Barn in Ottery St Mary offers something a little different. Furnished and presented to a very high standard, this detached barn conversion is ideal an place to spend quality time with family or friends and a perfect place to return to after a busy day during your holidays. With four en-suite bedrooms, a large living area and a very well equipped and sociable kitchen, there is plenty of space and comfort for all. The quality does not just stay inside, outside, guests will have their own hot tub and outdoor kitchen area to really ensure you have the best of both worlds. There is a private garden area but guest are welcome to walk through the surrounding grounds and meet some of the local animal residents who call the 8-acre grounds home. Located just outside the popular town of Ottery St Mary, where there is a good range of local shops and amenities as well as a super market. Ottery St Mary is famous for its annual Tar Barrel Carnival which is held in November to celebrate the Gun Powder Plot. Whether you are planning to just sit and relax or to get out and about, there is plenty to do locally or further afield. There are many places to visit close by, including the amazing Jurassic Coast World Heritage Site, Beer, Sidmouth, Seaton and many National Trust properties. Activities within easy reach include cycling, horse riding and birdwatching. Exeter’s 2000 year old history is reflected in its heritage attractions, such as the gothic cathedral and the Roman city wall. Explore beneath the city’s streets at Exeter’s Underground Passages. Go Ape at Haldon is a great day out, as well as the many walks and cycle paths in the area and Dartmoor with it ponies and small villages, tors and shops makes for a fantastic day for the outdoor enthusiast. For those wishing to enjoy a more adrenaline-charged holiday, the brilliant Ashcombe Adventure Centre offers quad bike safaris, clay pigeon shooting, archery, paintballing and much more. Devon has so much to offer, a week is never enough. There is a beach 9 miles from Wild Oak Barn in Ottery St Mary. With the shop, pub and restaurant 1¼ miles from Wild Oak Barn. Living room: With Sky TV (basic package), wooden floor and patio doors leading to garden. Kitchen/dining room: With breakfast area, electric cooker, microwave, fridge, freezer, dishwasher, washing machine, tumble dryer and patio doors leading to garden. Bedroom 1: With king-size bed, Freeview TV and en-suite with shower cubicle and toilet. Bedroom 2: With zip and link super king-size bed (can be twin beds on request), Freeview TV and en-suite with bath, shower cubicle and toilet. Bedroom 3: With zip and link twin beds (can be super king-size on request), Freeview TV and en-suite with shower cubicle and toilet. Bedroom 4: With zip and link twin beds (can be super king-size on request), Freeview TV and en-suite with shower cubicle and toilet. Electric underfloor central heating, electricity, bed linen, towels and Wi-Fi included. Travel cot, highchair and stairgate available on request. Welcome pack. Catering available by prior arrangement. Enclosed lawned garden with patio and garden furniture. 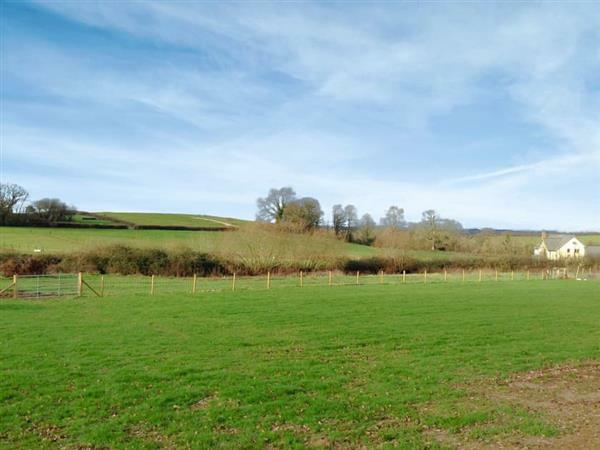 Natural, unspoilt 8-acre grounds (shared with owner). Hot tub for 8 (private). Private parking for 4 cars. No smoking. Holidays at Wild Oak Barn run from Friday to Friday. Pets allowed at Wild Oak Barn. For a better idea of where Wild Oak Barn is, you can see Wild Oak Barn on the map below. You can find more large holiday cottages (that's cottages which sleep 8 or more people) in Devon. If you want to see more large cottages, have a look at large cottages in Devon. Wild Oak Barn is in Devon; should you be on the lookout for a special offer, you can find all the special offers in Devon. It's always worth checking to see what is on offer at the moment. Do you want to holiday near Wild Oak Barn (UK10392), you can see other cottages within 25 miles of Wild Oak Barn; have a look to find your perfect holiday location.